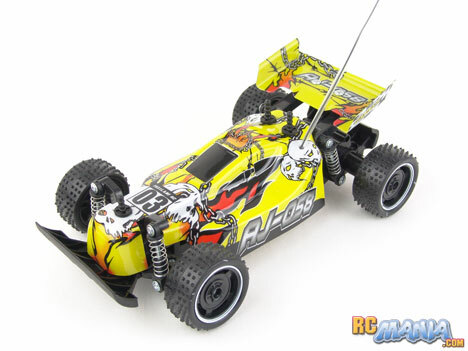 The AJ-058 is one of a small series of small, budget off-road RC cars from Fast Lane RC, available exclusively at Toys R Us. They call them "1/16th" scale, but at 9" long, they're actually closer to 1/18th scale in size. You can get this same vehicle in two different radio frequencies and also with a truck body (called the JF-056), but all of the ones that are this same size and price will perform the same way. The paint scheme is pretty wild, and the car looks low-slung and racy. The body is made of thin Lexan which lightens the vehicle and also makes it more resilient to dings & scratches. Lexan will bend and crease, but it rarely breaks. The car has independent spring suspension up front and combined one-way suspension in the rear. As is the norm in inexpensive RCs, the springs are much stiffer than they need to be, kind of defeating the purpose, but kids will still appreciate them as they can push the car down and watch the suspension compress. Batteries are not included with these Fast Lane mini cars. You'll need three small AAA batteries for the car, plus one 9V for the pistol-grip controller. When I first hit the throttle on the Fast Lane AJ-058, my jaw practically fell to the ground. I could not believe... how slow it was! I've tested some very slow RCs made for smaller kids, and this seemed slower than just about anything. I also very quickly got stuck. I thought I had accidentally installed some bad batteries, but after putting in another fresh set, nothing changed. The car is just terribly, terribly underpowered. To see if there were any conditions under which the car would perform acceptably, I took it to a perfectly flat, smooth concrete garage floor surface. There, the speed was probably just enough for a 6 year old kid, the youngest age the car is designed for. It just couldn't go over any sort of bump or incline, or even hard-pile carpeting, as the motor just didn't have enough "oomph." For my final tests and to get some video footage, I took the AJ-058 out to a recently-resurfaced, professional RC race track to just drive around the smoothest, most gentle areas on it. On a completely flat spot, again the car was okay (though still very slow), but as soon as I tried to turn slightly uphill, it started bogging down. It could not start on an incline at all -- it needed a running start. I also tried it on a slight bit of actual dirt, and it couldn't get over tiny grains of pebbles. See for yourself in the video! Before trying the Fast Lane RC AJ-058 buggy, I felt the worst off-road style RCs ever made were the Hot Wheels Fury FTX, which I was one of the very first RCs ever tested on RC Mania, and the earlier Fast Lane mini buggies. I think the AJ-058 has earned the distinction of joining that elite crowd. I am perfectly aware that this car is made for small kids, but it cannot even drive on an inclined driveway without crawling to a complete stop. For the street price of $25 USD, batteries not included, this car should simply not be allowed in stores. Congratulations to the Fast Lane AJ-058 for earning a spot in the files of RC Malarkey.